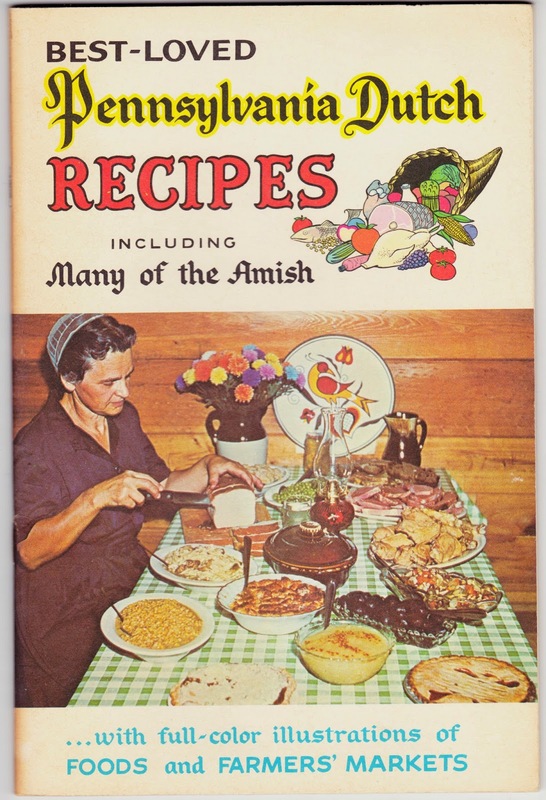 Papergreat: Enjoy a couple "Best-Loved Pennsylvania Dutch Recipes"
Here, for your potential culinary pleasure, are a pair of recipes from Best-Loved Pennsylvania Dutch Recipes, a 32-page staplebound booklet published in 1971 by Vincent R. Tortora and Photo Arts Press of Lancaster, Pennsylvania. Cut 3 LB. STEWING BEEF into cubes. Cover with water. Add SALT, PEPPER, simmer 2 hours, or until tender. Drain meat and hold broth. To meat add 10 DICED BOILED POTATOES, 1/3 C. MINCED ONION, 3 T. BUTTER, 2 T. CHOPPED PARSLEY, 3 BEATEN EGGS. Mix lightly. Set aside and prepare dough. Cut 2/3 C. SHORTENING into 2 C. FLOUR, 2 t. BAKING POWDER, 1/2 T. SALT, until mixture looks like coarse corn meal. Add 3 TO 5 T. COLD WATER (enough to make dough right consistency for rolling). Roll out dough and cut 4-5 inch squares. Put about 2 T. potato mixture in center of each dough square. Fold dough over, shaping like boy's leg. Pinch edges together. Drop into boiling broth. Cover. Simmer 25 minutes. Arrange "legs" on platter. Pour broth over all. Serve. Fry 5 SLICES BACON until crisp. Drain, reserving small amount of fat. In meantime, cook DANDELION GREENS as you would spinach. When tender, pour mixture of 2 T. VINEGAR, 2 T. SUGAR over top, along with small amount BACON FAT. Crumble bacon over top. Garnish with SLICED, HARD-COOKED EGG.